1. Definitions: (a) “Contributors” means the copyright and/or trademark owners who have contributed Open Game Content; (b) “Derivative Material” means copyrighted material including derivative works and translations (including into other computer languages), potation, modification, correction, addition, extension, upgrade, improvement, compilation, abridgment or other form in which an existing work may be recast, transformed or adapted; (c) “Distribute” means to reproduce, license, rent, lease, sell, broadcast, publicly display, transmit or otherwise distribute; (d) “Open Game Content” means the game mechanic and includes the methods, procedures, processes and routines to the extent such content does not embody the Product Identity and is an enhancement over the prior art and any additional content clearly identified as Open Game Content by the Contributor, and means any work covered by this License, including translations and derivative works under copyright law, but specifically excludes Product Identity. (e) “Product Identity” means product and product line names, logos and identifying marks including trade dress; artifacts; creatures characters; stories, storylines, plots, thematic elements, dialogue, incidents, language, artwork, symbols, designs, depictions, likenesses, formats, poses, concepts, themes and graphic, photographic and other visual or audio representations; names and descriptions of characters, spells, enchantments, personalities, teams, personas, likenesses and special abilities; places, locations, environments, creatures, equipment, magical or supernatural abilities or effects, logos, symbols, or graphic designs; and any other trademark or registered trademark clearly identified as Product identity by the owner of the Product Identity, and which specifically excludes the Open Game Content; (f) “Trademark” means the logos, names, mark, sign, motto, designs that are used by a Contributor to identify itself or its products or the associated products contributed to the Open Game License by the Contributor (g) “Use”, “Used” or “Using” means to use, Distribute, copy, edit, format, modify, translate and otherwise create Derivative Material of Open Game Content. (h) “You” or “Your” means the licensee in terms of this agreement. System Rules Document Copyright 2000, Wizards of the Coast, Inc.; Authors Jonathan Tweet, Monte Cook, and Skip Williams, based on original material by E. Gary Gygax and Dave Arneson. Star Wars Role Playing Game Copyright 2000, Wizards of the Coast and Lucasfilm Ltd.; Authors Andy Collins, Bill Slavicsek, and JD Wiker. Spycraft Espionage Handbook Copyright 2002, Alderac Entertainment Group, Inc.; Authors Patrick Kapera and Kevin Wilson. Shadowforce Archer Worldbook Copyright 2002, Alderac Entertainment Group, Inc.; Authors Patrick Kapera and Kevin Wilson. Modern Arms Guide Copyright 2002, Alderac Entertainment Group, Inc.; Authors Chad Brunner, Tim D’Allaird, Sean Michael Fish, B.D. Flory, Scott Gearin, Owen Hershey, Patrick Kapera, Michael Petrovich, Jim Wardrip, and Stephen Wilcoxon. Modern Arms Guide, Chapter 9: Other Gear Copyright 2002, Alderac Entertainment Group, Inc.; Authors Sean Michael Fish, Scott Gearin, and Patrick Kapera. The Archer Foundation Copyright 2002, Alderac Entertainment Group, Inc.; Authors Scott Gearin and Patrick Kapera. Soldier/Wheelman Class Guide Copyright 2002, Alderac Entertainment Group, Inc.; Authors Chad Brunner, Shawn Carman, B.D. Flory, Scott Gearin, and Patrick Kapera. The Hand of Glory Copyright 2002, Alderac Entertainment Group, Inc.; Authors Sean Michael Fish, B.D. Flory, Scott Gearin, Patrick Kapera, and Joe Unger. Gentleman’s Agreement Copyright 2002, Alderac Entertainment Group, Inc.; Author B.D. Flory. Pan-Asian Collective Copyright 2002, Alderac Entertainment Group, Inc.; Authors Steve Crow, Scott Gearin, and Clayton A. Oliver. Fixer/Pointman Class Guide Copyright 2003, Alderac Entertainment Group, Inc.; Author Scott Gearin. European Commonwealth Copyright 2003, Alderac Entertainment Group, Inc.; Authors Alexander Flagg, Lee Hammock, and Lucien Soulban. Faceman/Snoop Class Guide Copyright 2003, Alderac Entertainment Group, Inc.; Authors Alexander Flagg and Clayton A. Oliver. African Alliance Copyright 2003, Alderac Entertainment Group, Inc.; Authors Steve Crow, Alex Flagg, Patrick Kapera, Clayton A. Oliver, and James Maliszweski. The 1960s Decade Book Copyright 2003, Alderac Entertainment Group, Inc.; Authors Robert J. Defendi, B.D. Flory, Scott Gearin, and Clayton A. Oliver. The Shop Copyright 2003, Alderac Entertainment Group, Inc.; Authors Robert J. Defendi, Alex Flagg, Scott Gearin, James Maliszweski, Clayton A. Oliver, and Michael Surber. Agency Copyright 2004, Alderac Entertainment Group, Inc.; Authors Steve Crow, Alexander Flagg, B.D. Flory, Clayton A. Oliver, and Steven Peterson. Mastermind Copyright 2004, Alderac Entertainment Group, Inc.; Authors Steve Crow, Alexander Flagg, B.D. Flory, and Clayton A. Oliver. Most Wanted Copyright 2003, Paradigm Concepts, Inc.; Authors Alex Flagg and Mark Christensen. U.S. Militaries Copyright 2004, Alderac Entertainment Group, Inc.; Authors Brannon Boren, B.D. Flory, Clayton A. Oliver, Patrick Parrish, and Jim Wardrip. World Militaries Copyright 2004, Alderac Entertainment Group, Inc.; Authors Dave McAlister, Clayton A. Oliver, and Patrick Parrish. Battlegrounds Copyright 2004, Alderac Entertainment Group, Inc.; Authors Andy C. Davis, Alexander Flagg, Clayton A. Oliver, Jason Olsan, and Patrick Parrish. Dark Inheritance Copyright 2004, Mythic Dreams Studios; Authors Alex Flagg, Scott Gearin, Chad Justice, and Jason Olsan. 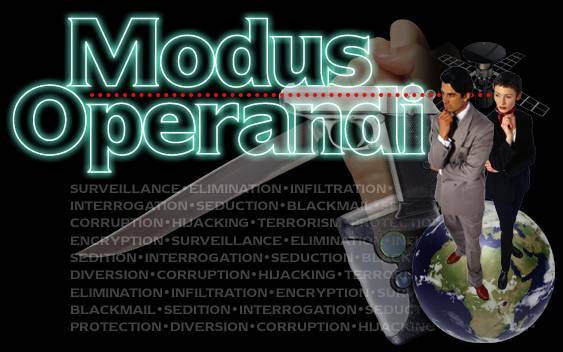 Modus Operandi Spycraft material Copyright 2002-2012, individual authors; Authors Chad Bowser, B.D. Flory, Chris Gunning, Cameron J. Haigh, Dave McAlister, Andrew M. Popowich, Zach Sutherland, CJ Tipton.